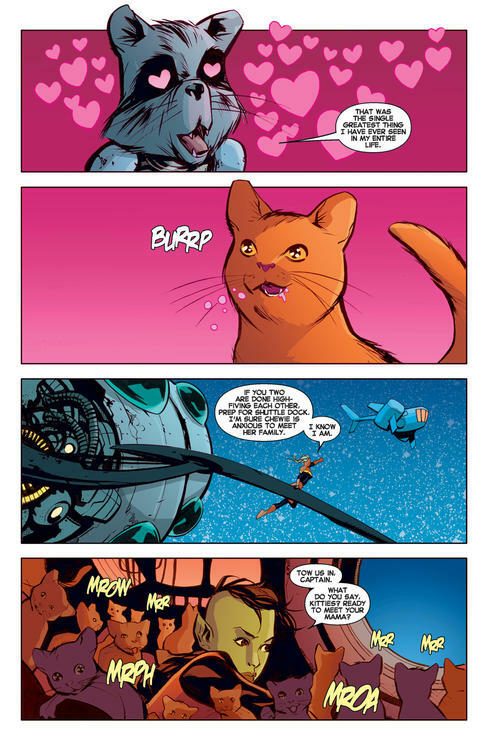 It wasn’t love at first sight between Rocket and the universe’s last Flerken! While Marvel fans across the world have recently received their first introduction to a Flerken on the big screen, the feline/alien creature has its genesis in the comics. In fact, CAPTAIN MARVEL's cat, Chewie, was outed as a Flerken thanks to an encounter with none other than the hairiest Guardian of the Galaxy! Kelly Sue DeConnick and artist Marcio Takara chronicled the tale in the two-part RELEASE THE FLERKEN story that appeared in CAPTAIN MARVEL #7-8. At the time, Carol was a member of the Guardians, and she had some friction with Rocket over her furry friend. Rocket was convinced that Chewie was a Flerken, and therefore, was a dangerous menace. Alternatively, Rocket also thought that Chewie would turn him a tidy profit if he could get Carol to sell her. Rocket even went through the trouble of reprogramming the ship’s A.I. to learn Flerken, which meant that it could only speak in meows for the duration of the adventure. Anyone who has ever owned a cat can tell you that they don’t really have a verbal language; a cat’s cry is always meant to communicate something, but it’s usually about the intent behind the cry as opposed to any actual words and sentences. This nuance was lost on Rocket, and Carol was very worried that her teammate would execute her cat over this continuous misunderstanding. Unfortunately for both of them, there was a much bigger threat on the horizon. A hostile alien race arrived and they demanded that Carol and Rocket turn over the last Flerken. Naturally, Carol wasn’t about to give in. But that’s when she discovered that Rocket had been right all along. Not only was Chewie a Flerken, she was no longer the last of her kind. She had just given birth to dozens of little Flerken kitties! But Carol is a protector at heart; her feelings for Chewie didn’t change just because she turned out to be an alien. That’s why Carol’s first thought was to evacuate Rocket, Chewie, and all of the Flerken kitties onto a shuttle piloted by Carol’s young friend, Tic. However, Chewie had other ideas and she tackled Rocket to prevent him from being near her young. The shuttle left without both of them, and Rocket had to deal with one very angry Flerken. Surprisingly, Rocket was able to talk Chewie down. Flerkens have a much better understanding of verbal communication than Earth cats. Rocket told Chewie that he felt an affinity for her, since they were both the last of their kind. And that was enough for the first ever Rocket and Chewie team-up. They fought the aliens who made their way onto the ship, while Carol and Tic took them on outside. As a Flerken, Chewie had a major weapon in her arsenal: the terrifying tentacles linked to the pocket dimensions in her body. It was the first time that Chewie ever showed off what she can really do, and Rocket was smitten after that. Anyone else would have been scared, but Rocket loved it. In the aftermath, Carol tried to leave Chewie and Tic with the kittens on an alien world. She explained that she loved them both, but felt it was the best way to protect them. In response, they let her leave just long enough to power up her ship before Chewie used her teleportation powers to bring herself and Tic back on to the ship. They refused to leave Carol’s side, and she happily welcomed them back. 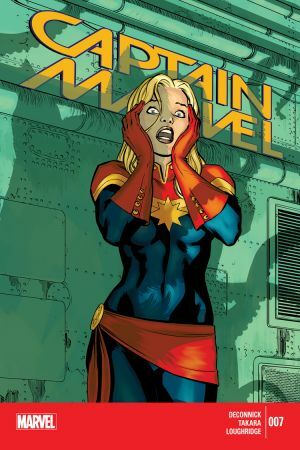 Read these issues and more on Marvel Unlimited right now!